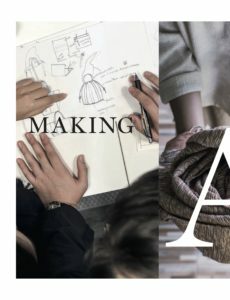 to belie the fact that she founded a brand that produces decidedly wearable coats, blouses, trousers, shawls and bags – on the face of it, a fashion brand. To Passawee, however, Folkcharm’s fashion is secondary in the big picture. 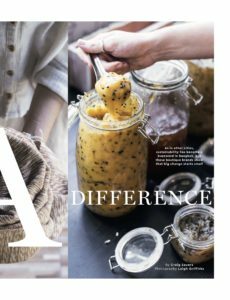 “Folkcharm is about preserving a traditional way of life while making it relevant. 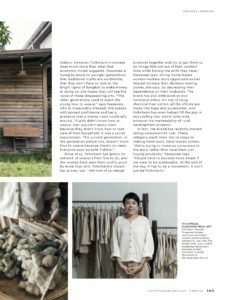 It’s not that I wanted to make clothes; clothes are just something that people use every day.” While her studio-showroom in the Bang Kapi district displays the label’s latest looks minimalist white, beige and blue cotton goods hanging from repurposed wooden shelves and bamboo rods, a layout inspired by the architecture of homes in the provinces – Passawee isn’t interested in being the next big thing on Bangkok’s runways. She has different dreams. 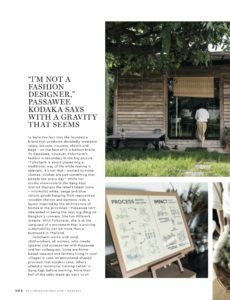 With Folkcharm, she is at the vanguard of a movement that is proving sustainability can be more than a buzzword in Thailand. Since 2015, Folkcharm has grown its network of weavers from five to 30, and the women have seen their profits grow by more than 30%. Folkcharm’s impact has grown, too. 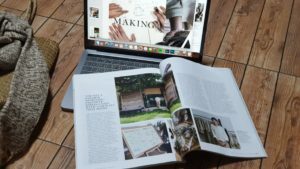 “We kind of co-design products together and try to get them to do things that are out of their comfort zone while honing the skills they have,” Passawee says. Giving home-based women workers more opportunities has helped increase their decision-making power, she says, by decreasing their dependence on their husbands. The brand has also embraced an eco- conscious ethos. On top of using chemical-free cotton, all the offcuts are made into bags and accessories. And Folkcharm has even helped fill the gap in storytelling that would otherwise enhance the marketability of rural development projects.